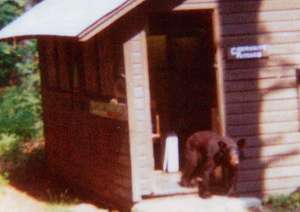 Bonni Braswell took this photo of the smaller bear leaving the kitchen of Cabin 2. Fortunately, all the food was in the refrigerators so he didn't get a meal. Rapidan Camps is in Bear Country, and once in a very rare while, bears come through camp looking for food. In late June 2001, for about a week, a mother and her cub were often seen around our cabins and the campgrounds downriver. Like all bears in the Shenandoah mountains, these bears eat mostly insects and fruit. Black bears pose almost no threat to humans unless threatened. Take care not to corner or surprise any bear. Make noise while walking. For more information about bears, visit the entertaining Guide to Shenandoah National Park--About Bears page or the Virginia Game and Fisheries Bear Information Page.